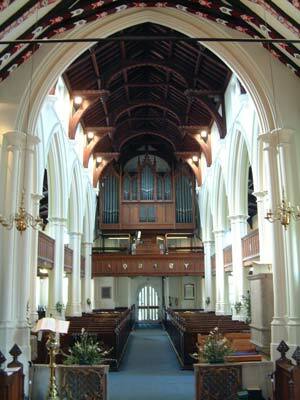 Structurally, there was no reason why the Georgian church should not have remained as it was but within 50 years of it being built, the population of Wimbledon had almost doubled to over 2,600. Moreover the railway, which arrived in 1838, offered prospects of even more rapid expansion. It was considered necessary to provide a further 400 seats to accommodate the larger congregation. The firm of architects chosen to carry out the work was Messrs. Scott and Moffat. Scott (later Sir George Gilbert Scott) was to become a most famous and prolific Victorian architect. As funds were limited, he was given a strict brief not to spend a penny more than £4000. He achieved this by making as much use of the old building as possible. He extended the old nave (which came roughly to the cross aisle) westwards and built a new tower and spire (196 feet tall) The existing Georgian windows were enlarged and given their present perpendicular form and the weakened walls were buttressed at frequent intervals. The slender pillars are not actually stone but iron shafts covered by plaster moulding. Scott provided new galleries and a new hammer-beam oak roof. Finally, in order to harmonise the old and the new, the brickwork was covered with knapped flints to make the whole look of one period. The rafters in the chancel roof could be mediaeval; they were discovered in 1860 when the chancel was restored and the rafters came to light with the removal of old galleries and a plaster ceiling. They were painted at the time with the current design of chevron with daisy and a stylised leaf and floral design. In 1993, St Mary's celebrated the 150th anniversary of the reconsecration of the nave and chancel and marked the event by undertaking various projects. The chancel roof was in need of repair and this could, and was carried out by the Church Commissioners. However the decoration on the rafters had become very faded over time so through the generous support of several parishioners, the repainting was carried out by a local architect, Peter Bond who volunteered to do the work.